Edmond Sumner (5) has played briefly in five games for Indiana this season. 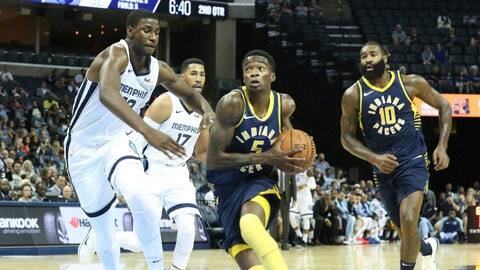 Guard Edmond Sumner and rookie forward Alize Johnson, who have been keeping the bench warm for the Indiana Pacers so far this season, have been assigned to the club’s NBA G League affiliate in Fort Wayne. Sumner and Johnson will have a chance to play more with the Mad Ants, who opened their season last week. Sumner was drafted by the Pelicans in 2017 and promptly traded to the Pacers. The guard played 14 games with Fort Wayne, averaging 7.2 points, and one game with the Pacers a year ago. He has made one of four shots while playing briefly in five games for Indiana prior to being sent to the G League. Johnson, a second-round draft pick by the Pacers in 2018, has gone 1 for 2 from the floor over three games.